Pickled herring is a real Scandinavian classic. This recipe has a summer approach with fresh vegetables. The Swedish name is actually “sommarsill”. The crisp bread is a fantastic pairing with pickled foods. Freeze the herring for at least 72 hours. Thaw the herring completely. Slice the onions and carrots 2 mm thin on a mandoline. Boil the water, sugar, salt, onions, carrots and pepper corns for 3 minutes. Let it cool. Add the distilled white vinegar and chill to 5-8° C (46.4 degrees Fahrenheit). If the herrings are big, slice into 2 cm bites. Add the herring to the pickling liquid and refrigerate for 20 hours. Add the remaining Components and knead for 8 minutes. Cut the dough into 10 x 5 cm rectangles. Let the rectangles sit for 10 minutes. Bake the bread until crisp and golden brown. Lightly butter the crisp breads. 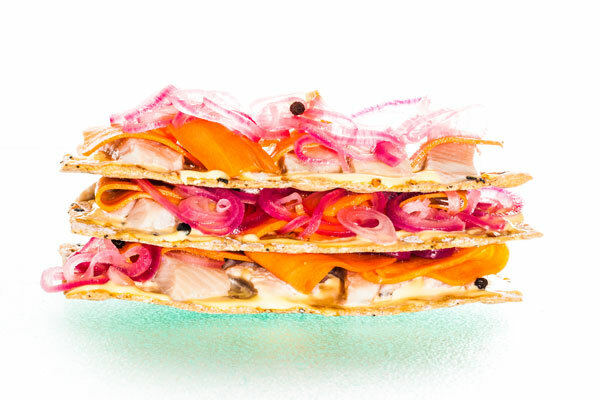 Arrange the herrings, carrots and onions on each crisp bread. Stack three crisp breads on top of each other.